Dubai, UAE, 27 September 2018: Emirates Group Security, part of Emirates Group, has been appointed as a ‘Regional Training Partner’ for the International Air Transport Association (IATA) to deliver courses in aviation security and related subjects. The agreement was signed by Dr Abdullah Al Hashimi, Divisional Senior Vice President, Emirates Group Security and Matthew Vaughan, Director, Aviation Security, IATA, in Dubai. Starting September 2018, Emirates Group Security will initially offer two courses on Aviation Security Management and Security Management Systems. Dr Abdullah Al Hashimi, Divisional Senior Vice President, Emirates Group Security said, “The availability of qualified talent and human capital is essential to any industry and aviation is no different. Aviation Security, in addition to being an integral and fundamental aspect of the aviation industry, has now evolved to become a core business enabler. We are delighted to be working in partnership with IATA on this initiative. “The courses offered jointly by Emirates Group Security and IATA will showcase the high quality of industry relevant content specifically tailor-made for professionals working in the aviation security industry. Designed with a focus to improve management practices in the industry, our training collaboration with IATA will help improve educational and professional development opportunities for the aviation security industry at the local, regional as well as international levels,” he added. “The Middle East is expected to grow by 4.3% per year to become a market of 430 million passengers by 2020. Forging strategic regional training partnerships is key to developing the skills and knowledge that will be critical to support this rapid growth, especially in the area of aviation security. This joint initiative with Emirates Group Security will build a talent pool across all facets of aviation security – a key element of IATA’s global security strategy,” said Matthew Vaughan, Director of Aviation Security, IATA. Emirates Group Security is a recognised thought leader in the field of aviation and general security. 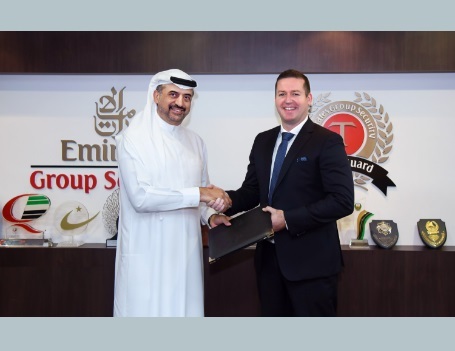 In Dubai, Emirates Group Security has established the Centre of Aviation and Security Studies (CASS) in partnership with Edith Cowan University to develop career ready professionals for the aviation and general security industry. Over 1600 students have graduated so far from the 18 month diploma courses offered by CASS in aviation security and ground handling. In 2017, Emirates Group Security worked with the UK government to develop an e-learning course aimed at preventing human trafficking.